Smoking in Private Clubs Petition? We're sending a message to legislators that no provision for a "Smoking Room" in a Private Club is ridiculous. The Smoke Free Illinois Act bans smoking in all public indoor places as of January 1st 2008 including bars, restaurants, businesses AND PRIVATE CLUBS. The law should have allowed for PRIVATE SMOKE CLUBS that only accepted and admitted members that approve of smoking. Instead, the act specifically prohibits smoking in private clubs. This is ridiculous! Why can't smokers get together - far away from all the cry babies - and light up a stogie? Not allowing PRIVATE SMOKE CLUBS goes beyond keeping second hand smoke away from non-smokers. It's a first step militant anti-smokers have taken towards banning smoking altogether. Representative William B. Black has sponsored House Bill HB4104 that would allow for Private Smoke Clubs if three fifths of the members approve. Hopefully, Illinois law makers will approve this bill. 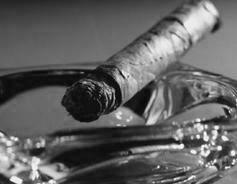 The only current exemption that is "friendly" to cigar smokers is tobacco stores and even those have restrictions. If they existed as tobacco stores prior to 2008, they are grandfathered. Otherwise, they must be in a standalone building where the smoke cannot affect other surrounding businesses. Also, the law prohibits those establishments to have a liquor, food or restaurant license. As of Feb 6 2008, there will be a hearing to discuss HB4104 by the Environmental Health Committee in Springfield, IL. Stay tuned for more details. Additionally, there is at least one other bill under consideration that would allow smoking in private establishments is passed See the Bills. As of March 2008, the bill was re-referred to the Rules Committee.